Split your existing mailbox into smaller files. Is there a better alternative to MBOX Breaker? Is MBOX Breaker really the best app in Email category? Will MBOX Breaker work good on macOS 10.13.4? MBOX Breaker needs a review. Be the first to review this app and get the discussion started! MBOX Breaker needs a rating. Be the first to rate this app and get the discussion started! MBOX Breaker splits your large mailboxes into smaller ones. Apple Mail, for instance, has a 1 GB limit on the size of .mbox files it will let you import, so MBOX Breaker could split your existing mailbox into smaller files that can be successfully imported. If you used a program like O2M to convert your Outlook PC mailbox into a Mac-friendly format, MBOX Breaker can split any oversized .MBOX files in order to maintain compatibility with programs like Apple Mail. MBOX Breaker works with all types of .MBOX files, even those on Unix systems. 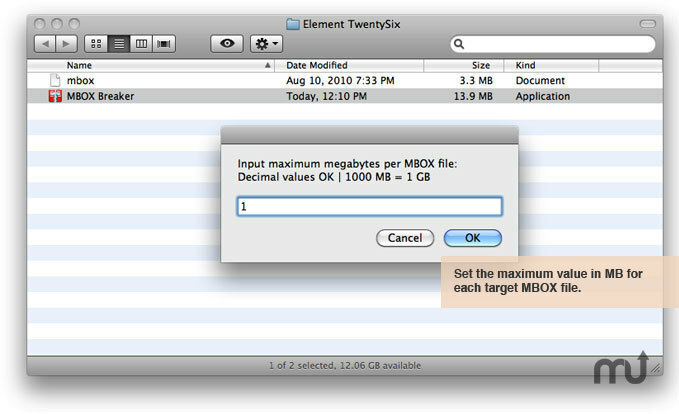 The trial version will only process 1 MB of your MBOX file. The licensed version allows for complete customization. Compatible with OS X 10.6-10.10+.